with just one coat of paint (it's getting too cold to spray paint so the next coat is going to have to wait for next year) she's starting to look pretty good. oh and there's one handle that's sort of broken but i think GI joe husband might be able to fix it. i'm still on the hunt for some more plates for little ones wall but all in all it's turning out pretty good...i'm working on my buffet today, i'm a painting machine! You are an inspiration to me that you get so much done! The new paint job looks wonderful and I love the beveled mirror above. I wish I had your decorating skills. I like what I get done but it's a real struggle for me, thus I don't change things often. You always have wonderful ideas. And your sewing is pretty awesome too! Oh, it looks great. 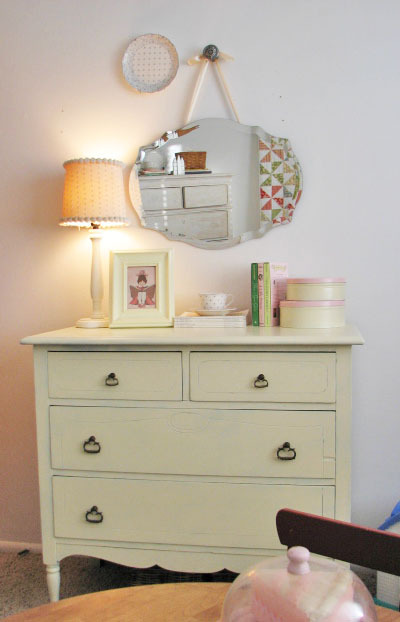 I would love to find a little dresser like that one. Very nice! Love your blog..
You have a good eye for diamonds in the rough! You are AMAZING! I need to take some motivation from you and some ideas too! Beautiful transformation!!! I love that mirror!! Wow! That turned out so nice. I'm glad we went back and got it and shoved it in your car! Did I tell you we found a great wooden headboard and footboard on the side of the road that we are going to refurbish for ashlynn's Paris themed room. You have inspired me!All it needs is some sanding and a paint job! That looks so fantastic! I love getting a finctioinal piece that is less than attractive and being able to see it for what it could be. I have 3 dressers that I have "fixed" and are now used daily. Sorry, not "finctional" ......I meant functional!!!! What can a tired mom of 4 say about her typing skills in the a.m.!!! I totally need a find like this! So you just use spray paint to fix up your wooden treasures? Any special kind? I've been wanting to redo a shelf that I have, but I'm scared to mess it up! I LOVE it. You did such a great job. I just redid a dresser really similar to yours, I love the stuff around it that you used to decorate it. i normally use regular latex paint but i had spray paint a lot of it so i used it this time. you need to sand it down some just to scuff it up and then you need a primer (this usually makes the paint stick better, but it's not necessary) then paint it. i'm not completely done with it but for now it will have to do, it still needs another coat of paint and to be distressed with a sander. next spring! I love how the dresser turned out!! Is the color a pale green or cream? Either way, it's beautiful and I love the handles. I also love your closet...I'm an organizing freak too!! Love to label everything. I am so happy I found your blog and envious of your sense of style! Thank you for being such an inspiration to those that love to thrift and go junking like myself. Your home is quite lovely! 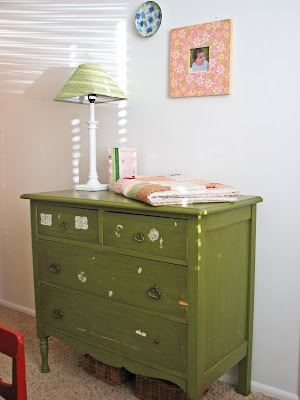 I love making over ugly furniture, and this is a great makeover. Oh I love it! And I am lovin the mirror as well!! Totally cute! Love the color! Do you mind sharing the brand/name of the color? it's actually just a base coat of ivory spray paint...i'm planning on painting it an off white, when i get that color i'll let you know what it is!